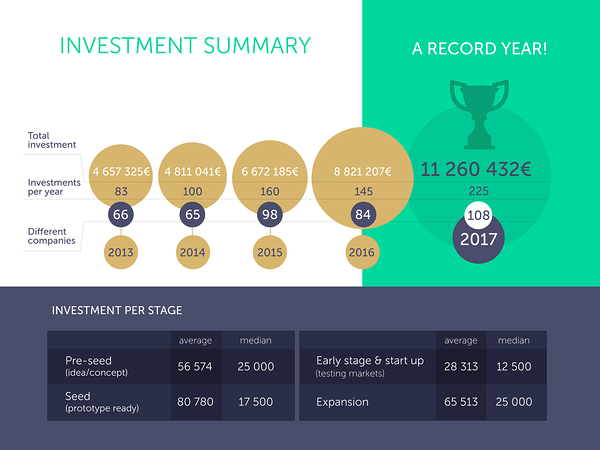 Members of the Estonian Business Angels Network (EstBAN) invested 11.3 million euros in startups during 2017, and the investments made by EstBAN members outside Estonia have grown. Year over year, the amount of money invested grew 28%. The president of EstBAN, Rein Lemberpuu, said that the amount invested by EstBAN members has kept growing year after year and last year another all time record was reached. The 11.3 million euros invested by EstBAN members went to 108 companies in 225 transactions. In 2016, altogether 8.8 million euros was invested in 84 companies in 145 transactions. The growth can be partially attributed to increased cross-border investment, Lemberpuu said. Where in the three previous years EstBAN members placed over 70% of their total investments in Estonian startups, in 2017 the portion going to Estonian startups was 59%, and 26% going to startups in other EU member states and 15% to startups outside Europe. Other than Estonia, the more popular investment destinations were Finland, the United States, the U.K., Germany, Denmark, Croatia and Norway. "The trend of internationalization is going on strong because the aim of EstBAN is is to help business angels find the best startups in Estonia and abroad. In February we launched a Nordic Angel Program with the business angel networks of Norway, Finland, Denmark and the Nordic countries," Lemberpuu said. Nordic Angel Program is a three-month business angel training and investment program led by experienced startup investors. NAP is a micro-fund type of co-investment syndicate where angel investors will participate with minimum tickets of €5000 and invest into 1-2 startups. Angel Investor of 2017 - Rein Lemberpuu for his outstanding number of investments and active role in the community. Lead Investor of 2017 - Lauri Isotamm was acknowleged for his active role in EstBAN board and leading the investment deals. Exit of the Year 2017 - INZMO with EstBAN members Ivo Remmelg, Kristel Meos and Kuido Lepik. The Newcomer of the Year - Risto Rossar, for his remarkable activities during one-year membership. EstBAN was established in late 2012 as an umbrella organization for business angels and business angel groups seeking investment opportunities in Estonia and its neighboring regions with an aim to enhance the quantity and quality of local seed stage investments. EstBAN has 125 members at present. As EstBAN celebrates five year anniversary this year - it’s suitable to thank the most outstanding partners who have supported EstBAN from the beginning - EBAN and FiBAN. EstBAN wouldn’t be here without the associated members - Ekspress Grupp, Telia, SmartCap, Hedman Partners, Eversheds Sutherland Ots & Co, Startup Estonia, Civitta, Tehnopol and Tallinna Business Incubators, Spring HUB and Contriber.